ksayerphotography: Tea and biscuits, anyone? There's nothing better than sharing good food with friends. A cup of tea and a biscuit? Of course! 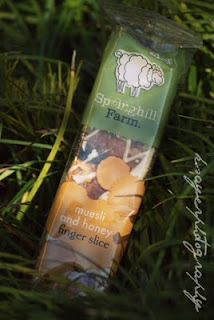 Springhill Farm were kind enough to send me a box filled with their delicious slices and biscuits so I did what any normal person would do - turn on the kettle and round up some taste testers! 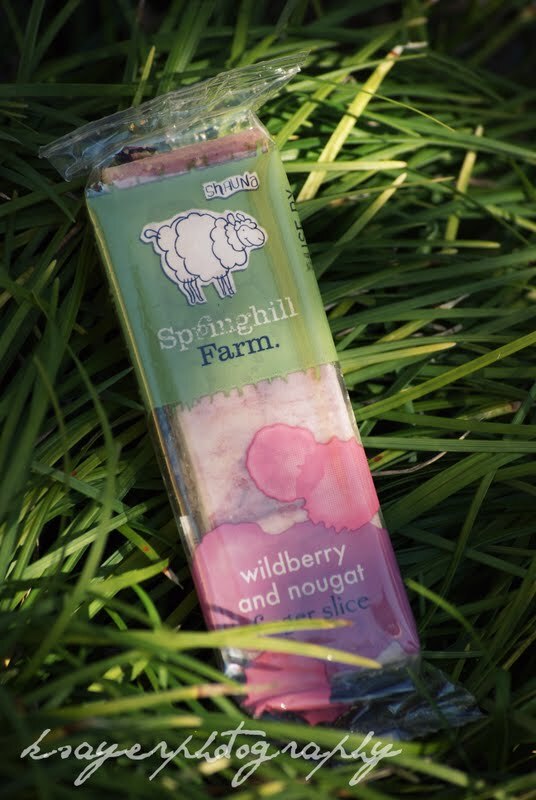 The Wildberry and Nougat Slice is a combination of Italian Nougat, dried cranberries, blueberries and raspberries and topped with white chocolate and a berry swirl. The soft base had a rich coconut flavour and I loved the chunks of berries, while the smooth chocolate topping melted in your mouth. I was actually surprised to find this was one of my favourites as I first thought it would be way too sweet, but thankfully it was jussssssssssssssssssssssst right! The Summer Fruit slice was courteously passed over to my taste testers as I'm actually allergic to pineapple and pear, which the bar contained. The slice is a combination of Australian dried fruits, amaranth and rice pops and topped with milk chocolate and a white chocolate swirl. 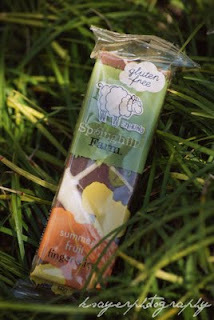 My taste testers liked the citrus and coconut flavours and, like the nougat slice, all agreed it melted in your mouth. It's also Gluten Free! so it's a perfect treat for someone with a gluten intolerance. The Lemon Lime and White Chocolate Biscuits are gluten free so they're perfect for sharing, even with your coeliac pals! We all agreed that they definitely don't taste gluten free. In fact, if I didn't know otherwise, I'd have guessed it was just a regular shortbread style recipe. 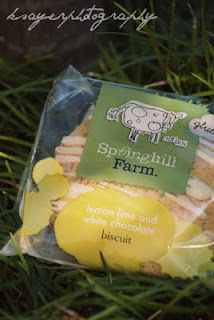 It was crumbly and melted in your mouth with a delicate lemon and lime flavour. The Lemon and Yogurt slice combined the smooth creaminess of yogurt with the freshness of lemon that was balanced perfectly. 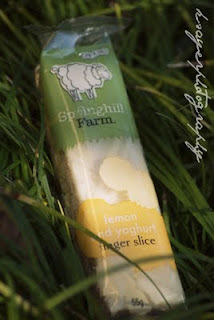 Springhill Farm have been using this recipe for 20 years and I can see why! The Springhill Farm journey began when Ray and Jo Barber hosted kindergarten and primary school children for a sensory filled farm visit experience in 1983. At the end of a day filled with horse and tractor rides, milking and collecting eggs, the children got to experience farm style cooking whilst sampling Jo's homemade muesli slice. The slice was so popular that Jo began producing it to sell and the Muesli and Honey slice is the original recipe enjoyed by the children on the farm visits. It's obvious why it was a hit! It's filled with whole grains, honey and Australian dried fruits and it topped with a creamy yogurt swirl. I loved the crispiness of the oats against the soft bursts of raisins and dried fruit. 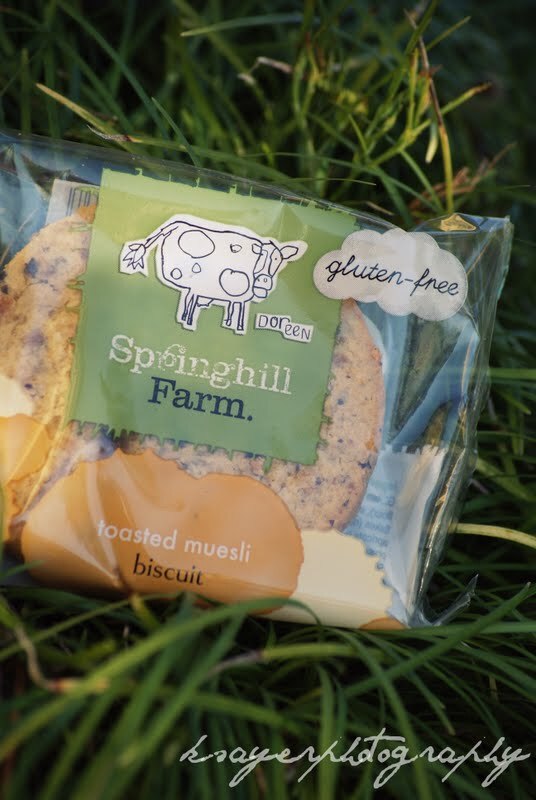 It's safe to say that the Toasted Muesli biscuit is delicious and most definitely one of my clear favourites. 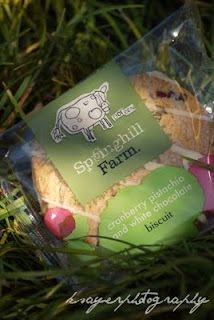 The moist biscuit is filled with chewy fruit pieces and crunchy rice bran flakes. The crunch of the rice bran flakes is definitely what made the biscuit for me - it took it from a boring old cookie to something you could enjoy time and time again. We decided if you gave us a lifetime supply of these biscuits, we'd be as happy as a pig in mud on the Springhill Farm! 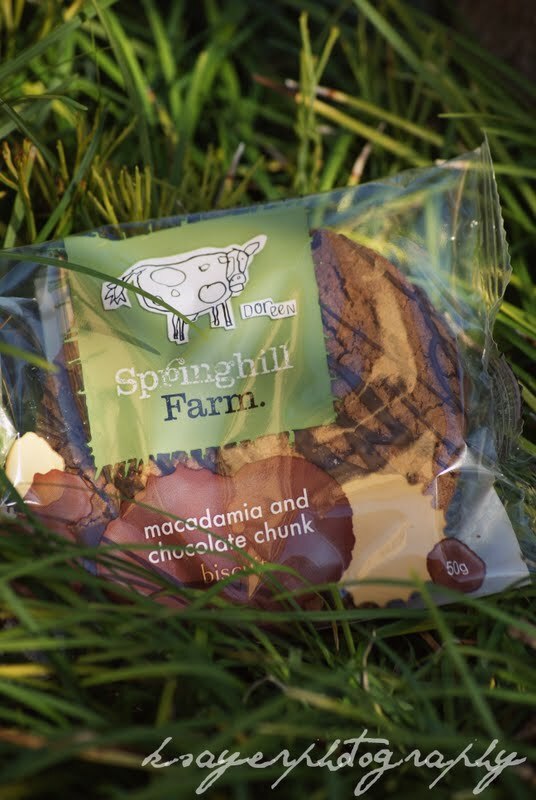 Springhill Farm has chocoholics covered too with their Chocolate and Oat slice and Macadamia and Chocolate Chunk biscuit. The Chocolate and Oat slice was also one of my favourites, so much so, that if you had me choose between the slice and the Muesli biscuit I don't think I'd be able to make up my mind! 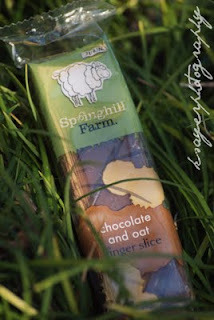 The soft oat base has a delicious coconut flavour and is filled with chocolate chips and delicious Australian Sultanas. It melts in your mouth, especially with the generous layer of chocolate sitting on top! 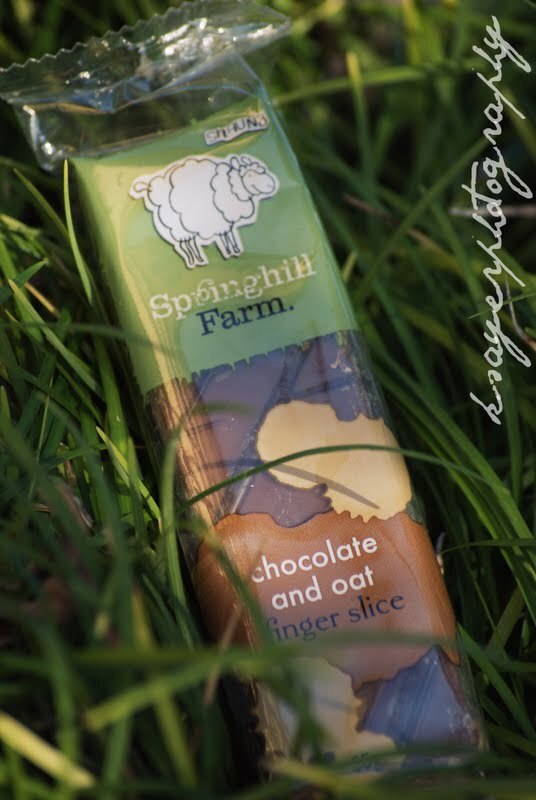 This is Springhill Farm's best seller and there's no doubting why! The Macadamia and Chocolate Chunk biscuit is for the serious chocolate lover! The chocolate biscuit base is filled with chunks of dark chocolate and Australian macadamias. It is the perfect accompaniment to a hot cup of tea or coffee! The Cranberry Pistachio and White Chocolate biscuit was generously filled with chewy dried cranberries and crunchy pistachios and drizzled with a white chocolate swirl. All of the ingredients match perfectly, creating a delicious biscuit! The Vanilla Chocolate Chunk biscuit isn't just your average chocolate chip cookie! The delicious vanilla biscuit is filled with generous chunks of creamy milk chocolate and topped with an extra chocolate drizzle. 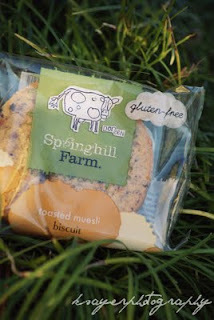 I was actually surprised when I realised the biscuit was gluten free because you could never tell! It melted in your mouth with a shortbread like texture and we all agreed it was an extremely high quality treat! All of these biscuits and slices were fantastic and I would happily serve them to my friends again! 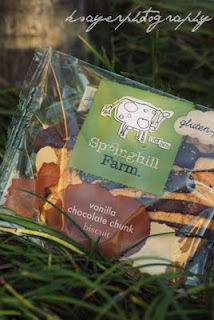 You can have Springhill Farm products delivered straight to your door by ordering online! and what's your favourite food to share with friends? definitely in a macadamia and chocolate kind of mood!! wouldn't mind the vanilla chocolate chunk either! I think I'm with you! 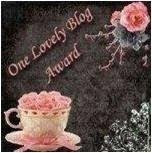 We need to somehow combine serenity and convenience.. hmmm, I wonder if that would work! I think that's the best thing about living in the suburbs! 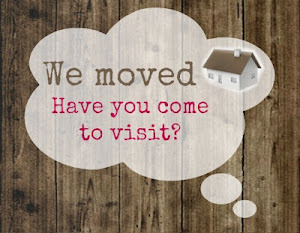 It's kind of an in-between because you can go to the city or the country!